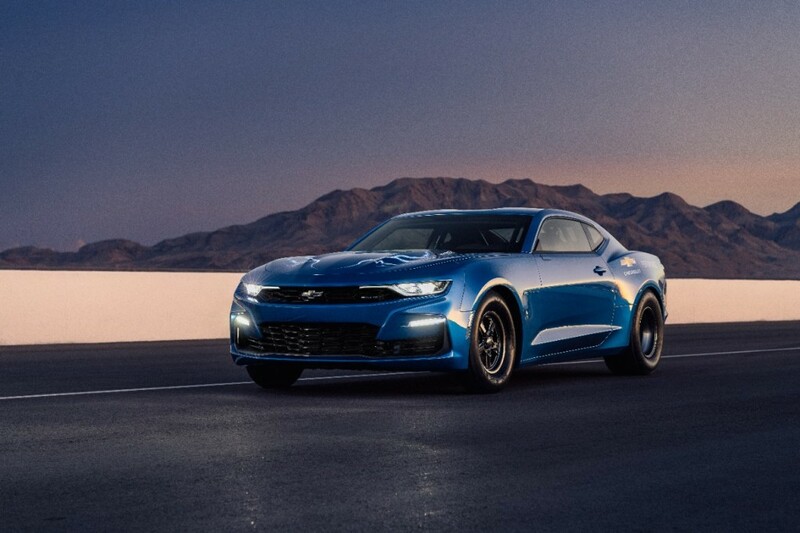 When Chevrolet first debuted the fully electric Camaro eCOPO at the 2018 SEMA Show in Las Vegas, the automaker predicted that it would be able to run a nine second quarter-mile. It was a lofty goal, but with the electric powertrain’s instant torque and Chevy’s drag-racing know how, we were confident that Chevrolet Performance would get the job done. We’re happy to report that the world’s first electric Camaro achieved its goal of putting down a nine second pass during the NHRA Lucas Oil Winter Nationals at Auto Club Raceway in Pomona, California this past weekend. The zero emission racer, which was designed and engineered by GM and is run by drag racing team Hancock & Lane, turned in a 9.837 pass at 134.07 mph. Driver Patrick McCue made his first attempt at the goal on Friday and turned in a 10.02 at 133.39 mph, but managed to dip the fully electric Camaro into the nines on Saturday afternoon with a near-perfect pass that pulled the front wheels well off the ground. The Camaro eCOPO makes 800 hp and 634 lb-ft of torque thanks to its two electric motors and 32 kWh battery pack. Power is sent to the rear wheels through the same three-speed automatic transmission the regular COPO uses. The location of the battery packs, one where the spare tire normally sits and one over the rear axle, ensures the eCOPO has enough grip to put its torque to the ground. When GM first debuted the electric Camaro eCOPO, the automaker said it was a sign of things to come from the company in the high performance vehicle and motorsports arenas. Check out the nine second pass in the video embedded above. Yawn…if not for pulling the wheels in the air, and actually seeing the 9.87 flash across the timing board; I would have figured that for much slower. Without the cacophony of a well built motor, most of the allure and excitement is lost. racing should be turning gasoline into noise. Follow-up: I’m nearly certain, that if this was a separate series it would have the same following as Formula E which is – pretty much non existant. Outside of companies trying to get greenie points and early adopters, no one cares about formula E. And if not for them hitching it to traditional racing series, it probably would have went the way of a most other fads. Watch a formula E race when you have some free time. After you wake up and wipe the drool from you mouth, holla atcha boy about how exciting watching what amounts to giant RC cars whine around the track was. The sound and cacophony is Essential to motor racing. That sensory overload is essential to the spectator relishing and partaking in the restrained danger of motor racing. Formula E and other form of electric racing just don’t deliver. Guys, it is still an electric go-cart. Maybe I’m old school but I like the sound and smell of an internal combustion engine. This car doesn’t have an engine it has D.C. Motor. To say it’s zero emissions is just bs, what about the emissions from the fossil fuel power plant generating electricity to charge the battery? And oh yea, last time I checked no-one had figured out a way to recycle or dispose of the batteries. I don’t know of a single racing enthusiast who would buy an electric Camero. Maybe Chevy should take a play from Porche and use the electric motor as a speed booster and leave the electric propulsion system to Tesla. I think air quality and ozone layer would be more important than our personal enjoyments. Thanks J.C. Back so soon? Considering air quality is no longer an issue and is arguable better than since the industrial revolution began – at least in the west – I’d say NOPE. As to the Ozone layer: who is still arguing about that. When I was a kid (1980s) all we heard about was the hole in the ozone layer – oh and we were taught global COOLING, NOT warming like now – then scientist discovered it may have always been there. *oops* – then that crusade quickly fell by the wayside. Now yes I and most anyone who lives on this planet cares about the environment…DUH! But can we all agree that the earth has been around LONG before we got here and was far hotter and colder since man has existed, or documented the weather change. We do not know whats going on with the weather or how to affect it directly. All we know is it changes, and some things may or may not have an affect, and that some of those affects are bad for humans. Frankly the earth can and may get far hotter or colder and we could go extinct or adapt and thrive, and the earth could frankly give a damn either way. Global change is merely humans griping and complaining about what is, or is not the most comfortable climate for humans. Nothing more, nothing less. this global warming thing is just to raise money for political parties and college profs who are paid to write these reports. they say burning fossel fuels is the cause but would not less fossel fuels be needed burned to keep people warm if the earth was warmer ? ?